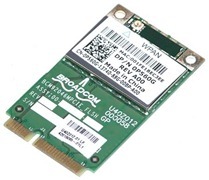 The 2.4 GHz Wireless 370 Bluetooth 2.1 Mini-Card from Dell is designed to provide high performance and an efficient Bluetooth solution for portable devices. It reduces the power consumption and increases the battery life by use of Sniff Sub-Rate (SSR) that lowers the number of times the Bluetooth device is queried. Also the Simple Secure Pairing (SSP) improves the pairing experience for Bluetooth devices, while increasing the use and strength of security. Features like Encryption Pause Resume enables an encryption key to be refreshed, for stronger encryption and longer connections hours. It provides more information during the inquiry procedure to allow better filtering of devices before connection by using Extended Inquiry Response. Additionally, Bluetooth 2.1 is backward compatible with 2.0, 1.2 and 1.1 Bluetooth devices.